Were it not for the source, it would hardly be news to learn that the United States can’t take care of its most needy—that it may be the richest country, but it is also increasingly, appallingly, unequal in how its wealth and opportunities are shared. When the various dimensions of human security are examined, critics have long noted that the US falls short, whether in treatment of children, poverty rates, income gaps between rich and poor, or even life expectancy. All this has been amply documented in annual reports of the United Nations Development Programme (http://hdr.undp.org/sites/default/files/2016_human_development_report.pdf), which I’ve discussed in previous blogs (#9 for example). But now comes an update from a distinguished international legal scholar who is the United Nations special rapporteur for extreme poverty and human rights. Philip Alston visited several deep pockets of poverty, from Los Angeles to West Virginia and Detroit to Puerto Rico, at the end of 2017. His report (UN General Assembly Doc. A/HRC/38/33/Add.1, May 4, 2018) is a devastating indictment of the government that underscores the large and growing contradictions between the American Dream and reality. Alston told The Guardian that Trump’s policies amount to “ a systematic attack on America’s welfare program that is undermining the social safety net for those who can’t cope on their own. Once you start removing any sense of government commitment, you quickly move into cruelty” (www.theguardian.com/us-news/2018/jun/01/us-inequality-donald-trump-cruel-measures-un). Harsh language to be sure, but not a novel observation. A good deal of the critique applies to previous US administrations. Let’s remember that the “war on poverty” began in 1964! What makes Alston’s report stand out is his contention that the Trump administration has deliberately targeted the most vulnerable in society, kicking away every ladder of social wellbeing in order to serve Trump’s rich supporters and his alt-right agenda. So it’s not just that this government can’t take care of the poor; it won’t. To read the essentials of Alston’s indictment, see the introduction at http://www.theguardian.com/world/2017/dec/15/extreme-poverty-america-un-special-monitor-report (also posted on my website under Recommended). Here are a few items that strike me as being particularly onerous—that is, criminal in intent and consequences. •	Debasing civil society: Supporting limits on voting rights with specious arguments about voter fraud and “covert disenfranchisement” such as gerrymandering and various ID requirements. •	Giving huge tax breaks to millionaires and big corporations while about 40 million people live below the poverty line—among them, 23.8 million considered in extreme or absolute poverty. The richest 1 percent of Americans now account for 20 percent of national income, double the percentage in 1980. “The proposed tax reform package stakes out America’s bid to become the most unequal society in the world,” says Alston in a separate statement (www.ohchr.org/EN/NewsEvents/Pages/DisplayNews.aspx?NewsID=22533). 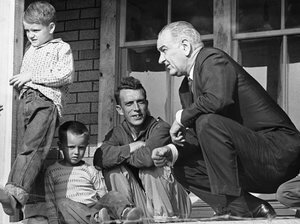 •	Putting new limits on basic anti-poverty measures such as work requirements for welfare, food stamps, subsidized housing, health insurance, and veterans’ benefits. •	Promoting racist stereotypes that seek to stigmatize non-whites as being mainly poor, lazy, and unworthy of uplifting. Except for The Guardian, I don’t believe any major news outlet has reported on Alston’s work. Only a few liberal politicians have bothered to comment. We evidently are so steeped in the mythology of exceptionalism that we refuse to believe we’re in decline in the most important measure of national security, namely, human security. We thus take comfort in being number one in military spending and the number of billionaires while also believing we can turn away from global affairs that affect every American: environmental protection, immigration reform, trade equity, and adherence to UN human-rights conventions. The Alston report’s findings are an indictment of the Trump administration and should become an article of impeachment. In terms of ethics and democracy, Trump’s actions may be more consequential than his currying favor with the Russians—not just because they debase and violate so many of our citizens, but also because they make a mockery of traditional (and worthy) American values such as lawfulness, community, and tolerance—values that once upon a time commanded international respect. This president has put himself and his cronies first and the rest of the country last. He has behaved in the manner of many Third World dictators: enriching his inner circle, paying off loyalists, giving the military everything it wants, attacking the key institutions of democracy and the rule of law, and marginalizing the masses. He must be confronted, and his authoritarianism must be decisively rejected. *These are the 37 member-states of the Organisation for Economic Co-operation and Development. Previous Who Is Kim Yong-chol? An overwhelming list of injustices and sadness to absorb. And yet to add one more point is the jailing of those living with a serious mental illness. Some estimates are 40% of people in prison have a serious mental illness. Here in Minnesota it is an accepted practice in prisons to put people living with a serious mental illness in isolation for behavioral transgressions. Many reports of people being put in isolation for six months and then released to the outside world. Wonder why we have 85% recidivism of people leaving prison…. Good post on an important topic. Re: “exceptionalism,” usage assumes positive traits, but a good case can be made for “negative American exceptionalism.” US poverty and treatment of the poor is one aspect, as highlighted in Post #207; also highest health care costs in the world, our gun policies and gun abundance, and our criminal justice system. Perhaps the subject of another post? The flag-wavers and Trump supporters can’t and/or won’t consider it, let alone think about it. Internationally, our rapidly sinking superpower is also quite exceptional, due to China’s technology and green leadership, Russian meddling with little or no resonse, and Trump’s alienating behaviors. Perhaps,Tom. I worry that too many observers are focussed on Trump the person,hoping all along that he will(eventually if not sooner) go away. The real problem is Trumpism,not The Donald. There are huge swaths of Americans who have chosen to live in the world of the uninformed,the undereducated(despite diplomas),who seek superficially easy solutions to complex problems, and who actively resent when someone comes along–from Mel to Obama to Amy Goodman and in between–who points to a nuanced approach to complex issues. They feel left out of the conversation because they have chosen some time back not to keep up, not to do their homework,etc.etc. This can be traced back to decades of creeping LUMPENPROLETARIATism and it is dangerous as heck. Thanks Mel for your thoughtful warnings. Will modern prophets be appreciated any more than biblical ones ? Alas, Peter, there isn’t a whole lot we can do about creeping lumpenproletariatism, at least any time soon, but elections do have consequences, particularly as we’ve seen with The Donald. Mel, I especially like your assertion that this report should be the basis for an Article of Impeachment. Of course impeaching a President for declaring war on the working class would require a fundamental (some might say revolutionary) shift in the politics of this country. And of course this is unlikely to happen in the foreseeable future. This is paricularly true when you consider that the opposition party has much to answer for when it comes to the findings of this report. When I think about serious attacks on the working class in the recent past, Bill Clinton comes immediately to mind. Mel, I missed this when you first sent it out. My email habits have gotten sloppy since retirement. Great piece. Thanks for doing it.